We think this is a brilliant little project: a portable, affordable HDMI screen for the Pi just isn’t available at the moment, and we know the demand is out there from what you’ve been saying on our forums. Head over to Kickstarter to let Alex and the team know you’re interested. We wish them the very best of luck with getting things rolling! Very kind words. We’re off to a good start. It seems a good idea on the face of it though I am a little unsure about using 12v to drive it? Could USB instead be considered perhaps please to make the entire system consistent? That said, I am unsure of the exact power requirements of the display and driver board etc… I do believe there is a competitor which uses USB power? Good luck! I imagine the 12V is driven by what screens are available for this size at a reasonable cost. Whilst they could probably add a DC->DC converter that would add additional cost, and if you were looking to power the screen from the same power supply as the Pi you’d need a power supply with two outputs or two power supplies (probably needing about 1.3A for the screen). What I think would be useful is a 12V to 5V output on the controller board to a USB socket. 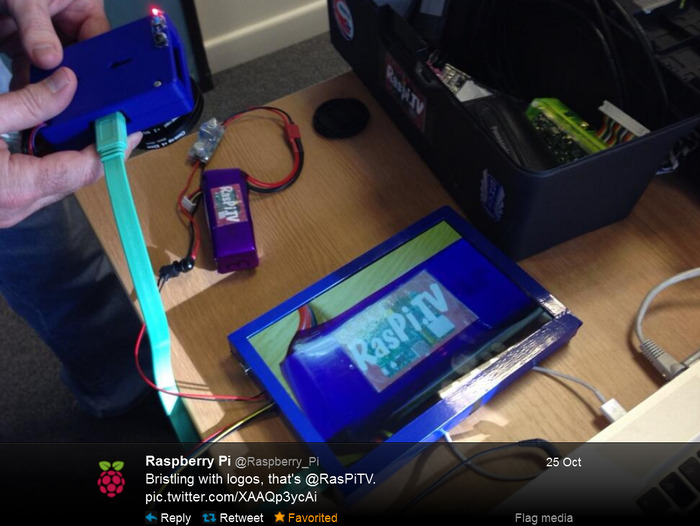 Then the Raspberry Pi could be powered from the same supply as the screen using a commonly available 12V 2A supply. This may be additional cost and complexity for the board, although perhaps less than going up from 5v). We think that would be good too Stewart. We’re considering it as a possible stretch goal. It’s a popular request, as is touch. That’s being considered too. I use a lot of cheap ebay switching regulators for both 12V and 5V (you can see one in Liz’s photo), but it would be less “hacky” if it was incorporated on the board. A great alternative to Adafruit’s screen. A suggestion: assuming the extra electronics are easy to solder, I don’t mind having the board not populated with those components. I can always buy new component and solder my own. But I’m really waiting for the Foundation’s work on LCD screen interface before making a decision on it. Best of luck with your Kickstart! I’d love to see it happen! I’m sure it would work nicely with the switchmode PSU kit I produce. The screen looks excellent! Shall look forward to browsing lots of pictures of the case etc as you get them produced. Always great to see quality stuff for the Raspberry Pi which extends how it can be used. Yes, why isn’t a DSI screen being developed? The foundation has gone very quiet on this interface. Excellent project, the first Kickstarter I have considered backing. What is the final design supposed to look like? How it connects? USB, HDMI, Camera connector, etc. How much is the final product? I think this will be really useful. Is the cable between the screen and the controller replaceable – or at least fairly strong? I wouldn’t want to have the screen unusable if the cable was badly handled, which could be an issue in a few situations. Either way I think this is great – I’ve backed the campaign. Looking popular so we are hopefully on the way to getting a reasonably priced screen for the Raspberry Pi. The current one is a lot like a larger version of the camera board cable, but once it’s in a case it should be “fit and forget”. The Pi connects by HDMI lead and we’re looking at a teeny one of those as a stretch goal as well. (Useful for if you want to mount the Pi inside the screen’s case). But it does give people the choice of a cable or a coupler especially if space is a factor in their project. Awesome Kickstarter project – is it me or do the only cool Kickstarters seem to have the Pi at the centre?! Makes me want to hurry up with my Kickstart! Also is it me or does Dave Mellor remind you of Jony Ive?! Just saw it! So did you go to a proper studio to film it then? Yes we used a company in Sheffield called Oxyfire. They’re really very good. more £10 if out of UK isn’t nice. but it’s really a nice project, congrats. Brilliant work – first kickstarter i have ever pledged to. Just curious – has anyone managed to connect a monitor to the socket on the raspi? You know, the one that looks like the camera connector but isn’t? With so many smartphones and tablets available in second hand, is the recycling of their displays, connecting to the Raspberry DSI port, the next soon-to-come way to DIY fit a cheap display to the Pi? All the best to your Kickstarter. That said, competition is always welcome. I would love to see this distributed in the US. Even from the UK with the £10 fee, at the current exchange rate it comes in at only USD $135. Good work guys! And it is 2″ more! For the price of Raspberry Pi, power adapter, SD card and this mobile display, I can get a full-blown tablet device with dual-core rockchip CPU, capable of running full ARM linux, HDMI out, same resolution (IPS technology), 1GB of RAM, >=4GB of internal storage, microSD slot, USB OTG and lots more. So in the end, I have more powerful device with twice as much memory, internal storage and battery. And, of course, the portability is much better. The only missing thing is the Rpi GPIO, which can be easily added using USB-to-i2c or something similar. Yes, the LCD displays for PI are overpriced at the moment – that’s why so many people are anxious to see the DSI port on the PI running.. I would donate for this, too – that would make much more sense to me. It’s a fair question. If all you want is a portable video player I think the tablet wins. Apart from the value of doing it yourself, I think the R-Pi advantage is that there’s a lot more information and support for low-level customization if you’re making some kind of embedded device, vs. a tablet which is intended as a consumer-only closed box. There may not be much community support for making XYZ external device work with your ABC brand tablet. Compare price of repairing a tablet you fried because you were trying to build a robot controlled by the tablet´s GPIO pins versus the price of replacing a Pi you fried because of the same reason. However this should not be a place to argue about the pros and cons of using a tablet instead. We want to play with the pi, I cant because I have no screen to use it with. I cant use my tablet with it either, but I take the tablet with me where ever I go. I have them for different reasons. yeah…the point. If all you want is a cheap tablet/media player then go get a cheap tablet. The raspberry Pi on the other is designed for people that WANT to play/make/develop with their PC and do all kinds of stuff with it. Its not meant to replace you PC or tabler or smart phone. Frankly, its original intention was for education. I apologize for terrible wording. My attempt was not to distract from this project to some tablets. I was just pointing at the price – that for the same price I can already have a ready-to-use device that can do everything I can do with this Pi display. Therefore the price seems incorrect to me and I would not support the kickstarter because of this. I for one am happy that proactive, positive things like this are happening and would like to congratulate Alex on achieving his Kickstarter goal. It’s the disatisfaction with what’s currently out there (or not) and the subsequent innovation, disruption and doing what you believe in — in any field — that makes a difference and leads to change. I remember at school taking in transistor radios that I’d designed and built. A common question was “why did you spend the money on that when you could buy one in the shops for less”. They of course completely missed the point, and so have you. What gives this kickstart project more than this? At first glance available inventory. I know this has been said, but I’d love to see one of these with touch. I’d pay more for touch obviously. If an expected cost for the screen was to be given then I too would like to sponsor the kickstarter – however without one then there is no way I am prepared to pledge some money when the “affordable” price may mean that its not actually affordable for me. Suppliers should be able to put together a quote on the cost of say 1k units, 10k units etc. So you would then be able to guestimate an approximate cost to the Picommunity. …with lots of photos that took me a very long time to get right. There were some “early-bird” offers at £65, but they sold out in 22 hours. You can now get one for £75 delivered if in the UK. International adds £10 shipping. Is it possible to pledge some money without Visa, MasterCard, or American Express? I don’t know. I think KS like to have a pre-auth transaction on a card as it makes it more secure all-round. Having said that, though I’m really not sure. I expect we could sort something out. OK cheers – I cannot see that in the linked post. £75-100 to me is not what I would pay for an “affordable” LCD screen. Certainly not one for a little device such as the pi. I can get a full HDMI monitor for that, with inbuilt PSU, controller and casing/stand. Thank you for letting us know – I’ll look elsewhere to resolve my lack of display. The Chalk-elec has a product, connecting with RPI HDMI port, using an 5V/3A power adapter, which is power the RPI also, this solution is touch-screen, resolution is 1280×800 (ok “just” 256K color) and 10″. I’ve bought it one in March, it is fully working. Ok, the price tag is $135, and today out of stock, but this is an existing product. I’m fine with Kickstart project, competition is welcomed, but this product seems to me far better. An d this company’s latest product is universal, not just for RPI. The only reason for existence of this Kickstart project is the price. If they can give it around $70-80, they can sell a lot. Oh, I forgot to say, that the panel is IPS. Yes, the Chalk-elec has touch, but our campaign has got off to a pretty good start and so many people have asked for it that we are looking into whether/how we can add it. It may be possible to add it as a stretch goal. Too early to say, but we would like to be able to do it. Our primary goal was and still is to produce something really good that’s much more affordable than what’s already out there. 1. You are right, I had to pay 27% VAT. 2. Their latest product is an 7″ screen with a build in universal HDMI adapter accepts any resolution up to 1920×1080. It is compatible with RaspberryPi, Beagleboard/Pandaboard/new Beaglebone, Hackberry, Odroid, Cubox, mk802 and others Android stick clones, Gooseberry, Nitrogen/Sabre, OLinuXino-A13, normal PC/notebook, video players, etc. But first, if you would like to your screen be portable, you schould design it to operate with 5V not 12V. Unfortunatelly it seems stucked. Noone can reproduce it, even me. and the chalk-elec doesnt come with a nice case that you can stick your pie into. besides, some of what should be realized here is that by supporting this, your also sort of indirectly support the Pi movement in general, which supports the higher ideals of education and the maker community. Is that worth the difference of 10 or 20 dollars (US) ? To me it is. Others not so much. I’m not against of Kickstarter project, and I’m not the agent of chalk-elec. Oh, to answer my own question, the board will be re-engineered and it will come with a case. Damn kickstarter for not accepting visa debit. I hope they make the goal, I want one! 75GBP ~ 120$ + shipping, and not touch screen …. You are totally missing the point about kickstarter campaigns and funding a project? The 85 GBP is not the price of the screen, its funding of the project and since I’m not in UK, it’s actually 75 + 10 shipping. Another portable display option, with possibly existing equipment, it to run tightVNCserver on the Pi, and link with ethernet cable or common WiFi to a netbook with tightvnc client. This also provides a keyboard and touchpad. Tim “Meltwater” Cox did a brilliant write-up of how to do that on his site. I regularly ssh into my Pis with my Nexus 7, but it’s not very satisfactory for VNC. I hope they sell them after the kickstarter campaign as well. It would be great if the HDMI driver / scaler board would be available separately at a very affordable price. That way we could recycle laptop screens. Why not open source the board ? A point I noted is that there is no “universal” driver, there is a need to customize or configure the driver to the specific LCD model it is attached to. I found the Wikipedia pages on LVDS and on FDP-Link interesting. I too would back a pledge on their custom driver PCB. for field work that requires some sort of black cloth hood against screen glare and keyboard, this will be welcome piece of kit. It only needs to be just big enough to give visual feedback that a 3 line text-LCD can’t offer. Please include in your Stretch Goal programme some physical keys/switches within ( or the back of ) the bezel so we can ditch our keyboard. There are a number of systems available you can incorporate that afford at least a 128 character set, and with their patent life over. Serious question: why the background music? In what sense does this add to the video? All it does for me is to distract from what the speaker is saying. I think I might have been quite interested in this project but I gave up half way through. Is there a chance that the Digital audio could be extracted from the HDMI, and made available as analog Line Out Signals? You can get a gadget at Amazon that pulls the audio from HDMI, and converts it to analog for headphones or RCA fittings. One of our prototypes does this. We hope to include it. I can’t say I’m excited for this; it’s just another HDMI LCD that I don’t think the market really needs (Of course, sellers will use Raspberry Pi compatibility to jack up the price of an ordinary panel). I would much rather see (And would likely back) a panel that utilized the Pi’s DSI port. HDMI is just too obvious. This looks fantastic and I want one! With Royal visits and Steve Wozniak calling the RPI “An incredible learning experience” on this weeks BBC Click the Pi is becoming a household name. like the one in olpc ? Great project. I was wondering, have you considered a version without the shell around the edge, and connectors on the bottom to allow developers to place screens next to each other, and use multiple pi’s to drive a larger screen? Depends how the screen itself is built I guess, but if the shell is just a bit you’ve added and the connectors can be placeable on the back rather than side then it’d be a great version of the product for the more ambitious developers! MagPi issue 18 – out now!